It’s no surprise why Pine Ridge Condominiums has been rated #2 in popularity out of 80 specialty lodging destinations in Breckenridge, Colorado on TripAdvisor.com, and was also given an Award of Excellence for 2012…it had everything we were looking for in a weekend vacation rental, starting with location, location, location. Main Street is where its’ at in Breckenridge, with tons of shopping, dining and nightlife options, all just a short, scenic, block and a half walk from Pine Ridge. Located in the 4 O’Clock neighborhood, we loved how secluded the property felt in the summer time, but are anxious to return in the winter to take advantage of its’ ideal ski-in location next to the 4 O’clock run; just a block and a half from the lifts means more time on the slopes. Our condo was huge with two bedrooms, two full baths, an enormous living room, dining area, full-size kitchen (with yes, even an oven) and full-size washer and dryer. And, hello, a real wood-burning fireplace with a stack of firewood piled on the mantle. We couldn’t get over all the special touches the owners added that really made it feel like home and show the pride in ownership Pine Ridge is known for. 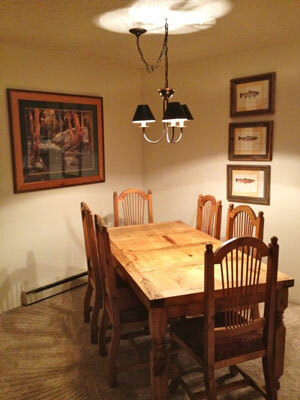 The décor and furnishings were modern and stylish, unlike what one usually expects from a typical ski rental property. Pine Ridge has spacious one and two-bedroom condos at 1,000 and 1,200 sq. ft. respectively, plus a two-bedroom with loft option at 1,500 sq. ft. and up to seven beds. It was more room than our little family of three knew what to do with and more room than you’ll find at most of the newer Breckenridge properties with much smaller floor plans. At other properties in Breckenridge, we’ve had to find parking off property and take a shuttle bus back. It was a luxury to find plenty of free parking at Pine Ridge, right at our doorstep. You’ll not need your car very much to get around though, as the local free bus has a stop right in front of the office. The management at Pine Ridge is super helpful with arranging anything you need from airport shuttle transportation to dinner reservations or dog sledding. They’ll also show you where the hot tubs, pool and fitness center are when you need a little down time from all the fun you’re having! Pine Ridge loves their repeat guests, and will offer you a discount on your next stay, even if you only stayed one night like we did. Looks like they’re stuck with us. 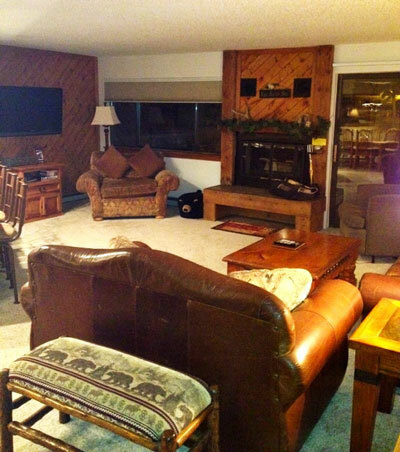 Disclosure: Pine Ridge Condominiums hosted my family for the purposes of writing this review. No other compensation was provided. All opinions expressed are my own and without influence by Pine Ridge Condominiums.